Search Engine Optimization is a 2 step process. First you need to attract the engines who will deliver the visitors. Once you have the visitor, you have roughly 28 seconds to engage them before they loose interest. Yeah, we live in a plugged in word and attention spans are short - there it is. "Consumers exposed to a YouTube homepage ad are 437% more likely to engage in a key brand activity on the same day than those unexposed." You can be sure that this will be an upcoming addition to my web site. How about we do the same for you? Check out our portfolio at http://www.cairnapps.com/portfolio/ and call us at (603) 966 6851 for a free consultation! Are we finally starting to question the app craze? I have thought for a while now that the app thing was a fad. Think about it, you have to have an app for the newspaper, the bookstore, the radio station, a separate app for each of your social networking sites. Wait. Stop. An app for your social networking sites? Why do I need an app for a web site? I thought that was what the browser was for! So why don't we just use browsers to run web applications instead of these platform dependent solutions that offer only limited functionality? In fact, the app crazy simply migrates the problem of platform dependent software from your desk top to your hand held device. Sales still can't communicate with marketing , creative or accounting. I was having this conversation with another developer this week and I asked him this same set of questions. He is developing an app for the iPhone that will facilitate e commerce in support of his wife's hobby. I asked him: "Why not just build a web site that will work on every device in the room?" The answer was appalling. Basically he told me that people are making an awful lot of money building limited applications that can be sold through the app store for 99 cents a pop. "Everyone else is doing it...now it's my turn." So sell a zillion copies and make a fortune. There are no customer support issues because no one expects it from a $1 application. If it doesn't work, who cares, it was only a dollar. Yikes. This has long been a quandary for me as a web developer. The applications I build all run in the browser window, the operating system doesn't matter beyond running a browser ( which is free ) and providing an internet connection ( which is ubiquitous ). Well, Reuters reported this week that the London Financial Times is pulling it's app out of the Apple App Store in favor of a web-based version of the same app! FT sites 2 major concerns. First and foremost was Apple's insistence that Apple retain control over FT's customer behavior data. This data, collected by the app, is critical for the demographic slicing and dicing that is the backbone of the marketing industry. The second objection cited by the FT is Apples 30% cut in app sales. FT is runs the first profitable web based news outlet and there is some question of the value provided by Apple in return fpor the 30%. For my developer friend, this is a no-brainer. He does not have the resources to market his application as effectively as Apple can, but FT is not encumbered in that way. FTs actions clearly validate the opinion that Apple's position as a content intermediary makes no sense and adds no value, but rather detracts from value. Free your apps! Deliver your content directly to your users. Call Cairn Applications at (603) 966 6851 to find out how. I am the President of Cairn Applications, LLC in Goffstown, NH. I find business owners unwilling to invest in web sites and web applications (my primary business) because they are concerned that the US Senate and House are playing chicken with our economy simply to score political points for the 2012 election. The small business community does not like uncertainty. The uncertainty that our leaders have created is stalling small business growth. Bottom-line: If my business can't make deals due to Congress's inability to create a stable financial climate, I can't grow my business and create jobs. Get it done, or get out of the way. Check out this great article on cnn.com by Doug Gross. This is exactly what I ave been preaching for a while now. Social media looks like it is there to serve you, but in reality it is a grand manipulation. Check out the article, I am ordering the book now. Nashua Expo 2011 was great! We had a great time at the Nashua Expo 2011! It was a pleasure to meet the folks at the Nashua Chamber of Commerce. A lot of business owners came by to talk about web design and search engine optimization and the importance of building quality content that engauges the visitor. If you are interested in seeing how Cairn Applications can design a successful web site for your business, then give us call today at 603 966 6851 or visit us online at www.cairnapps.com. 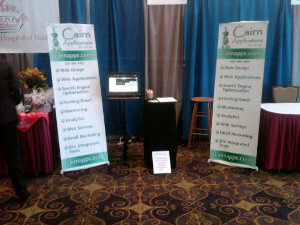 Cairn Applications will be exhibiting at Nashua Expo '11. The event will be held at the Radisson Hotel in Nashua on May 11th. The Expo starts immediately following Donald Trump's speech and runs from 2 - 5pm! We are really looking forward to meeting the Nashua Chamber of Commerce and the Nashua Business community. Apparently the email marketing firm Epsilon has inadvertantly exposed millions of email accounts via an unauthorized breach of thier systems. To be very clear Cairn Applications LLC does not use Epsilon for email marketing. We use competitor ConstantContact which was not effected. This is little comfort, however, given that the Epsilon client list includes a number of major retailers, service providers and banks. "IRVING, TEXAS – April 1, 2011 - On March 30th, an incident was detected where a subset of Epsilon clients' customer data were exposed by an unauthorized entry into Epsilon's email system. The information that was obtained was limited to email addresses and/or customer names only. A rigorous assessment determined that no other personal identifiable information associated with those names was at risk. A full investigation is currently underway."